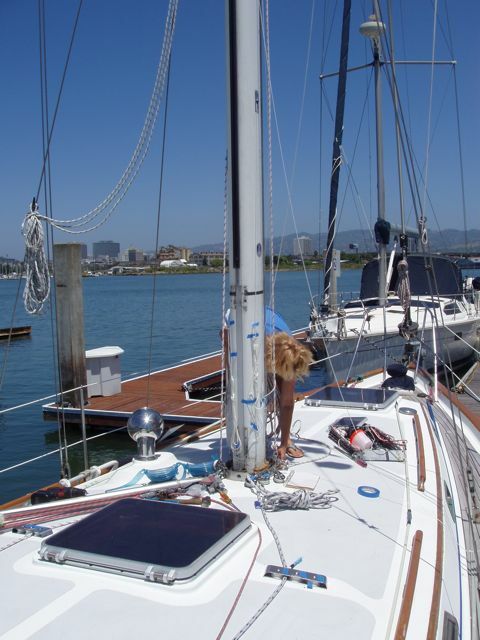 We're here at the Oakland Yacht Club in Alameda, CA. Svendsen's Boat Yard is performing as much work as we can afford. At $107/hour, we try to everything that we can and leave the specialist work to them. Conni and I worked today for 8 hours each or 16 hours. We saved ourselves $1712! 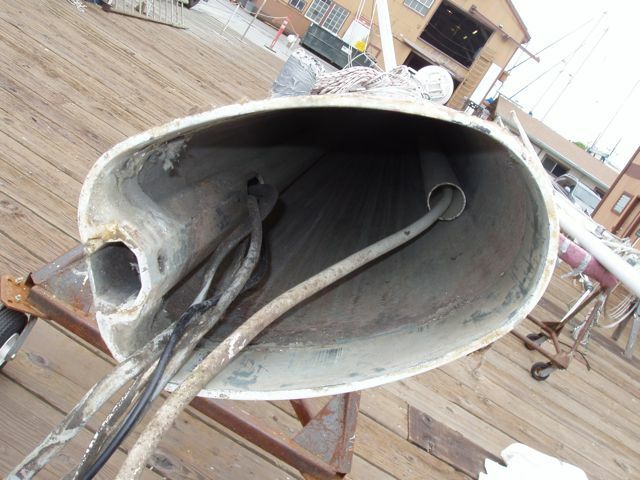 The stripped boom, ready for paint preparation. 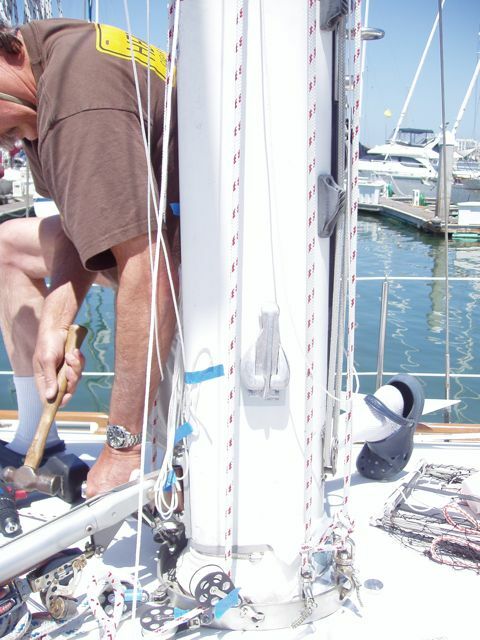 Bill, using his impact driver, toils to prepare the mast for painting. One hammers on an impact driver with a heavy hammer, and at each blow, it rotates a tiny amount, thereby loosening or tightening a screw or bolt. It's so powerful that it either removes the bolt or breaks it. 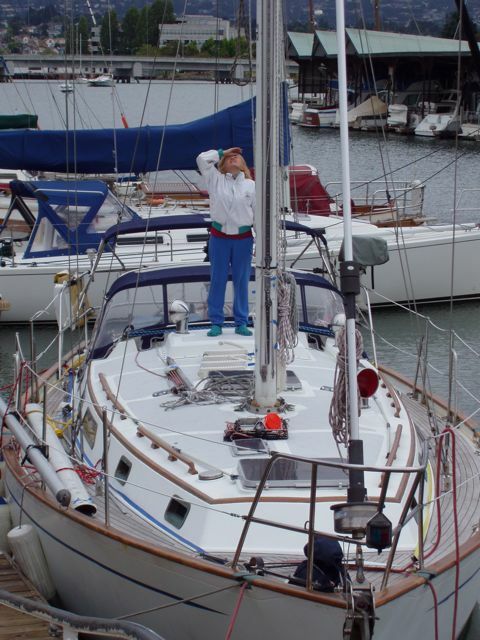 Conni labels halyards as she removes them. 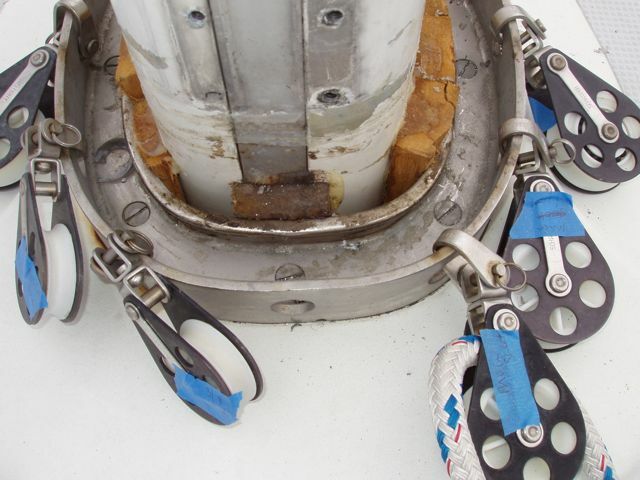 The mast was kept centered with these wooden blocks. 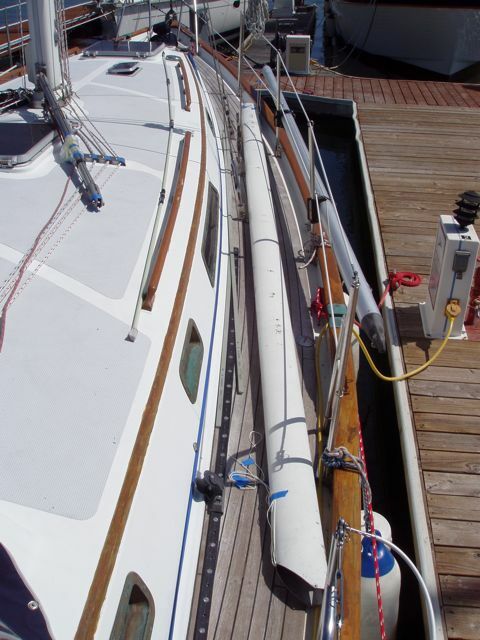 Not exactly high tech, but a traditional method of mast centering. Svendsen's Yard at last! 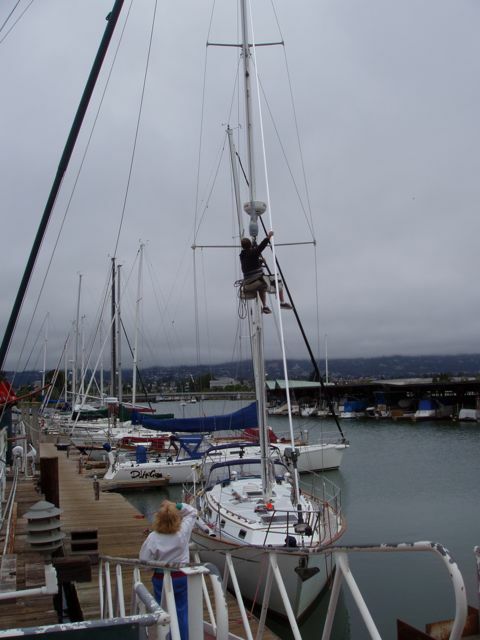 Chris, rigging foreman, is hauled up the mast to prepare for the mast pull. Conni watches Chris up the mast or Kalin on the hoist. Chris' rolling hitch on Spectra (a new aramid-based line with amazing strength) to hoist the mast. Remember how close to the deck the rolling hitch was? See it now? That section of mast hasn't seen the light of day in 28 years! Mastless! 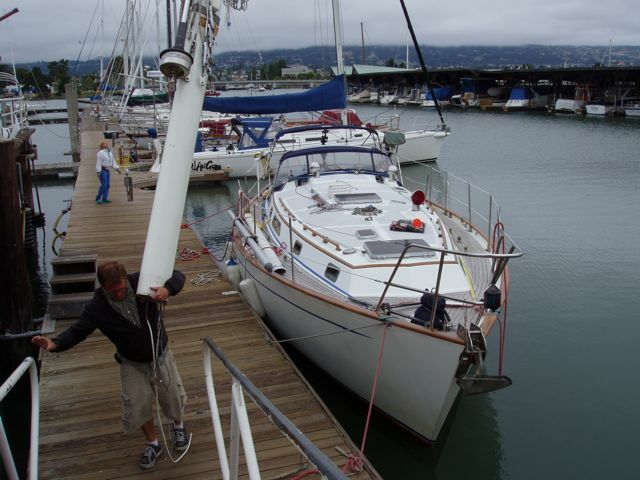 Wings sits forlornly as Chris moves the mast bottom to the dock work area. 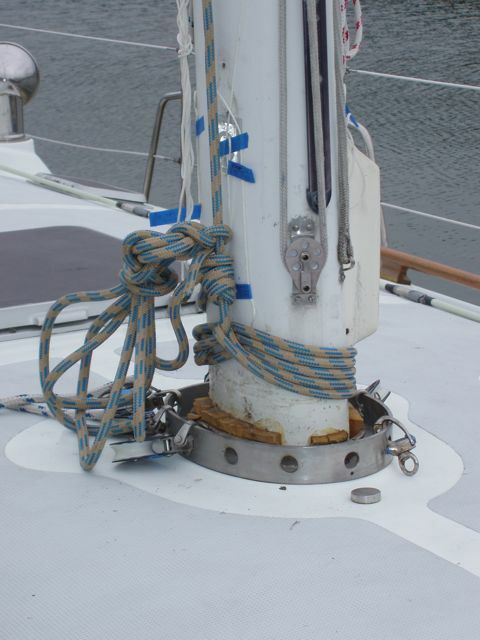 The mast collar without a mast to hold. A view up the mast from the bottom end. The mast sits on two wheeled cradles. 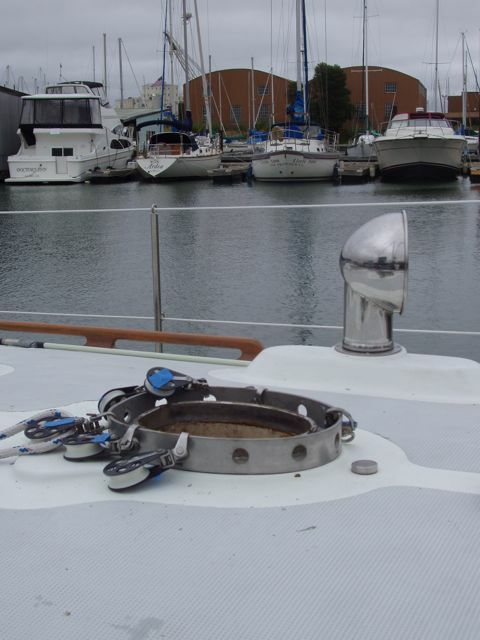 The conduit at right holds the radar cable and the conduit at left holds all the other electric wires: VHF coaxial (small white), anchor light, foredeck/bow, wind instruments. 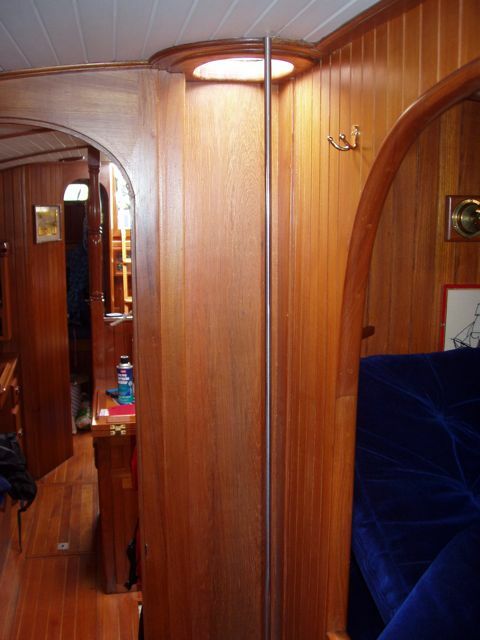 The empty closet for the mast aboard Wings. Our berth is at right. 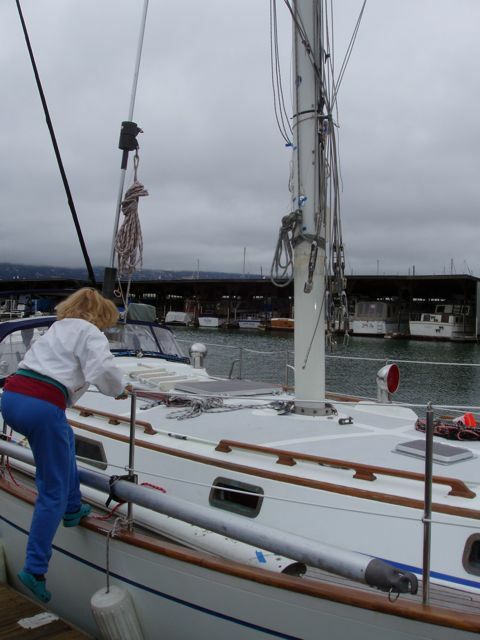 Conni works on stripping the mast in Svendsen's mast yard.